I feel like a kid that should be walking away with his head down in shame. In last month’s income report, I mentioned how I fully expected to make less money this month because I wasn’t going to offer any more services through Obstacle.co. That was kind of a lie. I was still going to offer services, but I was going to do so through a new micro-agency that I created with my brother. It’s called SproutKit. Right after I published the income report I came up with the bright idea to offer something that I called the Blog Takeover. The goal was to help bloggers reach 1,000 subscribers or +1,000 if they already have a list. That means I would act as a full-on marketing, design, and product team for the blogger. Why 1,000 subscribers? Because that is sort of the magical threshold. Once you learn how to get to 1,000 subscribers you can learn how to get to 100,000. A 1,000 people on your mailing list gives you a ton of options. Imagine you came up with a $100 product. You spend a couple days or weeks preparing your audience for that product so they are foaming at the mouth to get their hands on it. When it arrives 50 people buy it. Just 5% of your list. Seems small, but that is $5,000 in your pocket. Not too bad at all. So what happened with the Blog Takeover? I made over $5,000 in a couple of days with this service. I saw similar results in September with the Pinterest Takeover. Building a successful blog takes time and while most people know that they can do it on their own, things go a lot faster when you have someone more knowledgeable standing by your side. It speeds things up and you get from Point A to Point B a lot faster. This is why I decided to keep these services alive in the form of a micro-agency that my brother is now helping me with. What might surprise you about the money I generated from offering this service is that it was done with a list of 443 people. If you read last month’s income report then you can see I had 409 subscribers at the end of the month. So in one full month, I increased my mailing list by 34 people. For someone trying to help others build their blog audiences that should be kind of embarrassing, but for me it wasn’t. Because all of my focus was on my clients and other sites. I’m very fortunate that I have an audience that believes in what I am doing and allows me to make this kind of money at this stage of the site’s existence. Unfortunately, I’m well aware that this can both hurt and help my brand. For those that are just focused on the money, these numbers look awesome. 5 figures by the 5th month of blogging? Sweeeeeeet. For those that take a step back, you are going to raise an eyebrow. Why? Well, you should be thinking that it is easy for someone to make money from an audience that is also learning how to make money and you would be absolutely correct. If it was this easy then everybody would be doing it. There is still a lot of knowledge (and luck) involved, but the niche this site belongs to lends itself to an audience that is willing to spend money. Your niche might be a little more challenging. I understand that and because this site is about encouraging people to build profitable businesses from their blogs I knew I need to take a different approach. So you’ll never guess what I did. I created a 60-Day Challenge for myself. In this 60-Day Challenge I am going to pick a topic, build a blog, and turn it into a $1,000 a month machine by December 31st. Oh, and it won’t be about how to make money. So how is this even possible? There are a couple of different ways but the approach I’m going for is what I like to call Pinterest overload. It’s something that I’m doing with some of my Blog Takeover clients and it’s been working really well for Thrive/Strive. The 60-Day Challenge is the first time I’m showing it off but it completely changes how to launch a blog. If you want to learn about it sign up for the 60-Day Challenge or wait till I put into Powerful Pinterest Profiting (at a higher price). I am now running 4 different blogs (6 if you count BlogRocket and SproutKit). That’s a lot to chew and I haven’t totally come up with a system to make it all work, but I’m close. I can’t allow myself to teach others how to make money with their passions and interests when the only way I make it is by teaching people how to make money. I just can’t do it. I want an empire. It’s very much possible to build one from a single site, but all of the top bloggers that talk about money and do really well for themselves only have one big site and it happens to be the one about making money. I think by December 2017 I can have 5 blogs each making $50,000 a month. I don’t hesitate, pause, or stutter when I say that. In 13 months I want 5 different sites pulling in at least $50,000 a month. But enough about the future, let’s talk about what happened last month. First, I’d like to show you a screenshot of Obstacle.co’s PayPal earnings. Because the majority of Obstacle.co’s revenue is coming from services it’s probably close to reaching its peak. Services aren’t scalable and raising prices is an option but that prices out people who really need and deserve help with their blogs. That means revenue has to flip over to digital products and that is the focus this month. The Gain 1,000 Course is being re-launched and Powerful Pinterest Profiting is being updated due to changes made on Pinterest and the addition of the Pinterest Overload technique. Again, the focus wasn’t on traffic generation or building up any of my social media profiles. The focus was on building the foundation of my other sites. As you can see, pageviews have decreased for the second month in a row. If you are running a blog around ads this would be deadly, but because I don’t depend on ads it doesn’t affect me. If pageviews don’t affect me the same way as it does with other sites then why do I show it as a metric? The reason I show pageviews as a metric is because it’s sort of the industry standard for how popular a site is and as you can see Obstacle.co isn’t very popular. It’s also a metric that a lot of blogs in other niches need to use to track their growth. For me, the only effect it will have is how many people have a chance to sign up for my mailing list so it’s time to get that number back up. This month I’m all in on the traffic train. I’m going to increase pageviews by 600%. That’s right, folks. I’m going for 30,000 pageviews. I haven’t used the Pinterest Overload Technique yet with Obstacle.co so it’s time to make it happen. This is the 6th month of the $500k Challenge and the foundations have been built so it’s time to take off like a rocket. What are Blog A and Blog B? If you’re on my mailing list you’ll find out about them and if you can’t bother with such things then I’ll talk about them next month. I’m not necessarily trying to keep them secret, but at the time of this writing there are a couple things left to finish so I would hate to send you to something that isn’t ready. Because I have moved all Obstacle.co services off to SproutKit I’ll try to keep that revenue separate. That means Obstacle.co’s revenue has to come from the digital products that I create. A little scary, but it’s time to make it happen. Overall, the goal is to make over $20,000 this month. This is especially challenging due to Thanksgiving and the end of the year holidays. People tend to be a bit more conservative with their money so I might be asking for more than I can actually make. To everyone that leaves a comment, writes me an email, or shoots me a tweet, I want to thank you. It’s no fun working in a vacuum and interacting with all of you helps to push me forward. 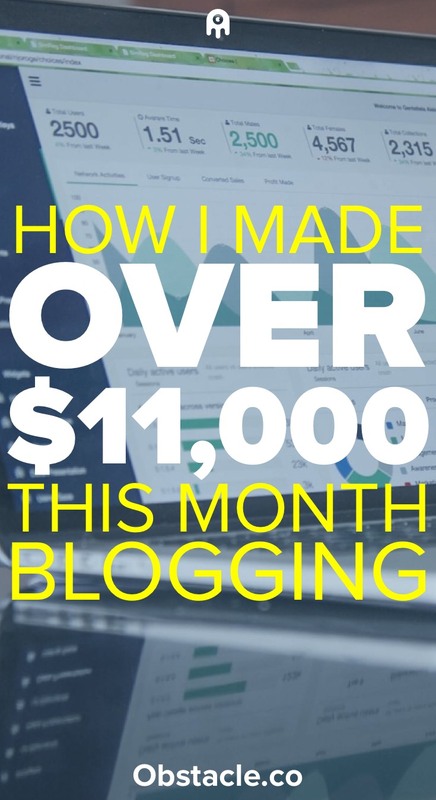 You don’t get what you don’t ask for so I’m asking you to take a second to share How I Made Over $11,000 In My 5th Month of Blogging with your audience. They respect great content.